There’s no two ways about it: The 2013 Nissan Altima is one of the most impressive 2013-model year vehicles there is. It’s full of tech, fuel-efficient, comfortable, attractive, powerful, and is even a bit luxurious, and you get all this for a starting MSRP of just over $23,000. There’s one thing that you don’t hear about too often with the 2013 Altima, though, and that’s safety features. Many trim levels of the 2013 Nissan Altima come standard with safety features that you may expect to see in cars that cost in excess of $50,000; one of these features is the Lane Departure Warning System. This system works by having a small camera scan the lane markers as you drive. If the camera senses that you are going to drift out of your lane, a warning light will turn on and you will hear a subtle beep. Another impressive safety system is the Blind Spot Warning System. The same warning light used with the Lane Departure Warning System will emit if you try to change lanes when another vehicle is in your blind spot. It will even apply the brakes if the warning is ignored. 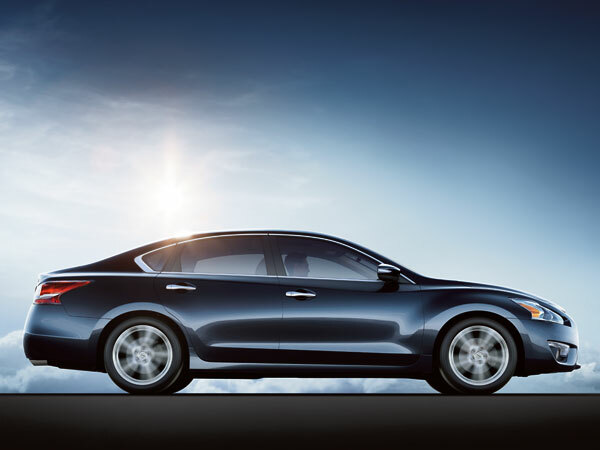 Yet another safety system featured in many trim levels of the 2013 Nissan Altima is the Moving Object Detection System. The backup camera begins coming standard on the 2.5 SV trim level, and the Moving Object Detection System takes the camera a step further by adding clear guidelines to offer perspective and emitting a warning tone if something might be in the way. Previous Previous post: Your Thanksgiving Dinner is on Us! Next Next post: Would You Buy This Nissan Car For $3,000?